My parents brought these chairs and three part table from UK in the `1950's. Very good to excellent condition. Bought from dealer in UK by my parents in 1950s. Thank you for submitting photographs for appraisal at MEARTO. This is a beautiful set, all appears to have been made in the 20th century. The table - with the wonderful bellflower inlay on the legs - is characteristic of the Federal style while the chairs are Chippendale in style. While they may have been made by the same maker (I can't tell that from the photographs - there should be a manufacturer's brand or label somewhere underneath the table top or under the chair seats or inside the seat rails). Given that these were probably not made as the same set, the chairs (a set of 6, 2 armchairs, 4 side chairs) has a value of $300-500 while the table has a value of $500-700. 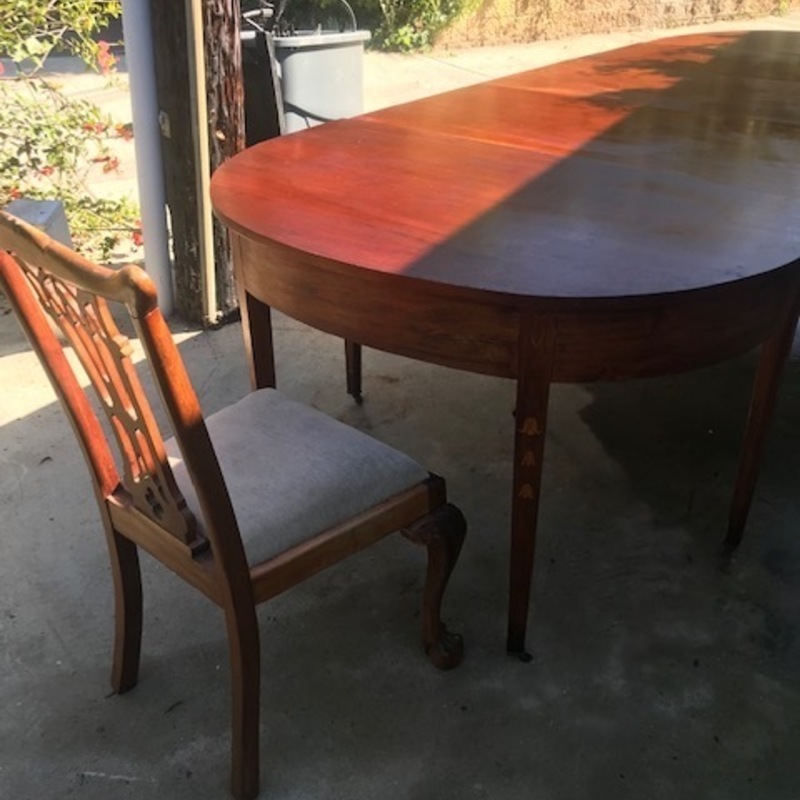 If you determine the chairs and table are from the same set, it would have a higher estimate - possibly as much as $1,500-2,500 but I strongly doubt that is the case. Regardless, there is always a market for handsome tables and large chair sets so you should not have a problem finding a seller for these. I hope this information has been useful to you; please let us know if we can be of additional assistance.